The Roland GX-400 vinyl cutter/plotter is extremely simple to operate and offers enhanced versatility. Produce clean, crisp: vehicle graphics, stickers, labels, stencils, pin striping, decals, signage, and even window tint. The Roland GX-400 vinyl cutter/plotter enables you to create full-color POP displays, professional vehicle wraps, and even heat transfers for garments, by its ability to contour cut pre-printed graphics. Roland GX-400 vinyl cutter/plotter comes complete with bundled Cut Studio design software at no extra charge. The Roland GX-400 is your number one solution for vinyl cutting and all your desired cutting applications. No other vinyl cutter/plotter offers the versatility and flexibility offered by the Roland GX-400. The Roland GX-400 vinyl cutter/plotter shifts all your production into high speeds. The Roland GX-400 achieves maximum accuracy and cutting speeds up to 33in. per second via the implementation of its digital servomotors. The Roland GX-400 ensures you will receive premium cuts with the thickest of materials thanks to its impressive 350 grams of down force pressure. In conclusion, the Roland GX-400 vinyl cutter/plotter yields better looking graphics with faster production times than any other vinyl cutter/plotter of its kind. The Roland GX-400 stands out amongst other vinyl cutters/plotters due to one very innovative feature. The Roland GX-400 vinyl cutter/plotter also provides a powerful and cost effective print and cut solution due to its optical registration system which automatically recognizes printer crop marks. Open the doors to endless amounts of new opportunities with the Roland GX-400 vinyl cutters/plotters ability to pair with an existing printer. Create professional graphics with your current printer, load them into the Roland GX-400 for a professional contour cut, and embark on new projects such as: heat transfers for garments, vehicle wraps, and POP displays. From 3.5in. to 46in. 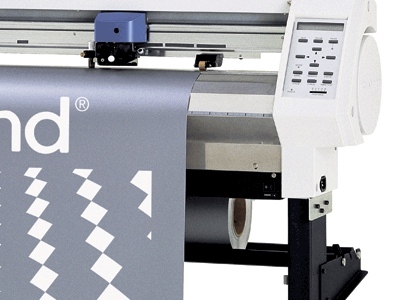 wide, the Roland GX-400 vinyl cutter/plotter accepts a vast variety of materials. The Roland GX-400 can cut vinyl, reflective vinyl, sand blasting material, heat transfer material, twill, and paint mask. With Roland Film Design software, you can even cut window tint film. Precisely match almost every vehicle window dimension on the market in seconds. In addition to the variety of materials and applications, the Roland GX-400 vinyl cutter/plotter features both front and rear loading. You can feed the media backward for a specified distance, then cut and feed the media forward. In addition to the standard media holder, load two rolls on the front and two rolls on the back with three optional hangers. These extra functions generate faster production time and greater versatility when using the Roland GX-400 vinyl cutter/plotter. The Roland GX-400 vinyl cutter/plotter is extremely easy and fun to use. The control panel and operating instructions are designed to be comprehensive to even the most novice users, even if you have never used a vinyl cutter/plotter before. 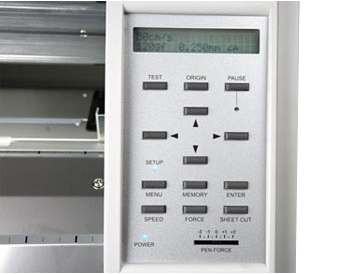 Included in the front panel of the Roland GX-400 vinyl cutter/plotter are buttons for frequently used settings such as cutting speed, origin points, and blade force. The Roland GX-400 can store up to eight pre-set job cutting conditions including: blade compensation, blade force, cutting speed, tool movement speed during tool-up and cutting mode. The implementation of all these features in the results in a small learning curve. The Roland GX-400 vinyl cutter/plotter comes equip with Roland Cut Studio design software for FREE. Roland Cut Studio allows designers to quickly and easily reduce, enlarge, rotate, re-position, and mirror images. Also supported by Roland GX-400 are BMP, JPG, STX, AI, and EPS file formats. 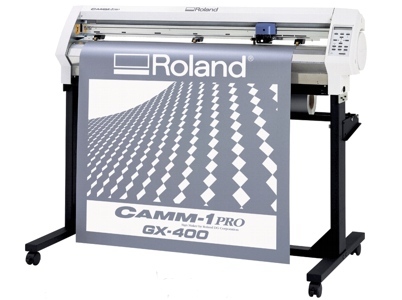 In addition, the Roland GX-400 vinyl cutter/plotter is compatible with all professional sign making software. As well as a Windows printer driver; Roland GX-400 bundles plug-ins for Corel Draw 10/11/12 for Windows, Adobe Illustrator 9/10/CS/CS2 for Windows and Adobe Illustrator 9/10/CS for Mac. Also available is; Roland Film Design, a revolutionary design software that has reinvented the auto tinting business. Loaded with powerful design features, Roland Film Design offers access to over 2,000 different window film pattern kits covering more than 1,000 different vehicles and is compatible with every brand of vehicle tint film. In conclusion, Roland GX-400 vinyl cutter/plotter makes for the perfect, versatile, user-friendly operating system. Danny Martinez was great to work with. He answered all my questions and made the purchase of our Roland GX-400 simple.